I have not worked on the Bellingham Farmhouse since before Christmas. I original stopped working because of the holidays then I began sewing little dresses for the my 18 inch Madame Alexander dolls. There was another reason, a more serious reason, why I couldn't make myself get back to work on the house. The electrical system had failed and I couldn't figure out why. 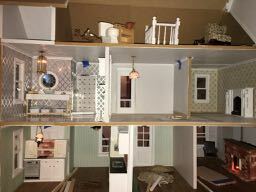 When I wore out that obsession, I decided to get back to work on the house with the intent of finishing it. The lights are on again, but what a chore. The photo below shows how I had to add more tape wire to bypass where the failure was--I think the connection that is covered up under the green wallpaper had failed, so I rerouted the wiring. Not a pleasant chore. I thought--and I still do think--that the humidity in the basement has altered the manufactured wood that the house is made of. We have two 110 gallon aquariums in the basement that emit a lot of humidity so we bought a dehumidifier again affecting the porous wood. I don't know. I am just really frustrated with the tape wire electrical system. I may not use it again. So you can see where the original line came up through the stairway from the second floor and over to a line to light the first floor ceiling. It was that line that failed. I don't know why it took me so long to figure out the easy fix--to run a new line from the bedroom. So the lights are on now. 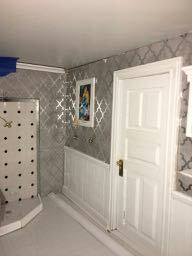 Next I began working on the bathroom. I assembled the bathroom wall before I installed it. Don't know if I will do that again either. I have tightly cropped the photo as the wall lays flat on the work table. 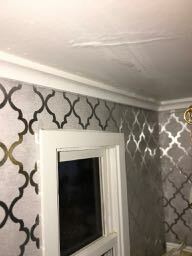 The wall paper is craft paper. 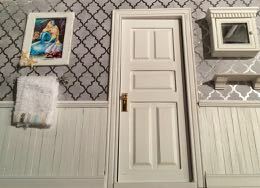 Now I see that Its Bitsy wallpaper has this print now. I wanted a beach or mermaid theme and found the picture on the the web. The frame is actually part of the original windows pieces from the kit that I didn't use but it made a perfect picture frame. I am sorry that my iPhone photos are so blurry. In the photo app they are clear. I thought it was my camera's fault, but when I compare my photo is iPhoto it is crisp and clear, the phone photos use quality in Blogger. 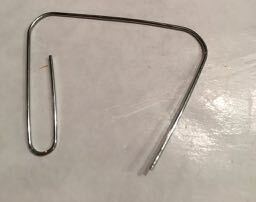 I decided to make towel bars and hit upon the idea to use the paper clip that on the table. I dug ? through my beading stash and found these little findings and they are perfect. What was I going to use for the towel ring. I bought three different types of rings. 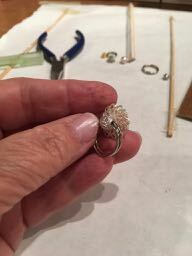 One that was a solid ring but then how would I attach it to the finding? 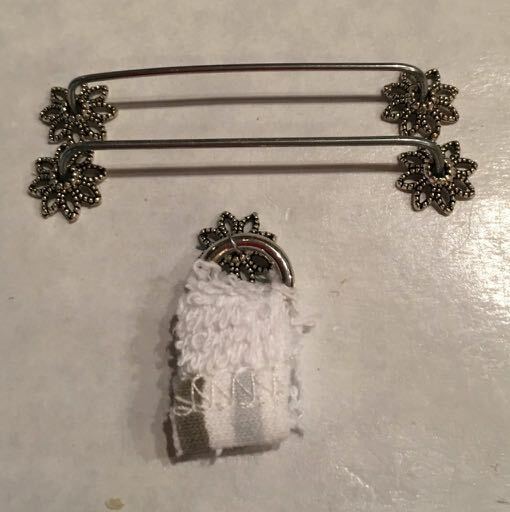 I found a tutorial and that builder used a ring that could be opened so then I bought a very small key ring that had the double ring--shown here. The result was okay but not quite the look that I wanted. 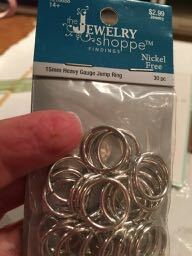 Then I found these rings at Hobby Lobby that can be separated and closer to the size, about half an inch. I love the result. 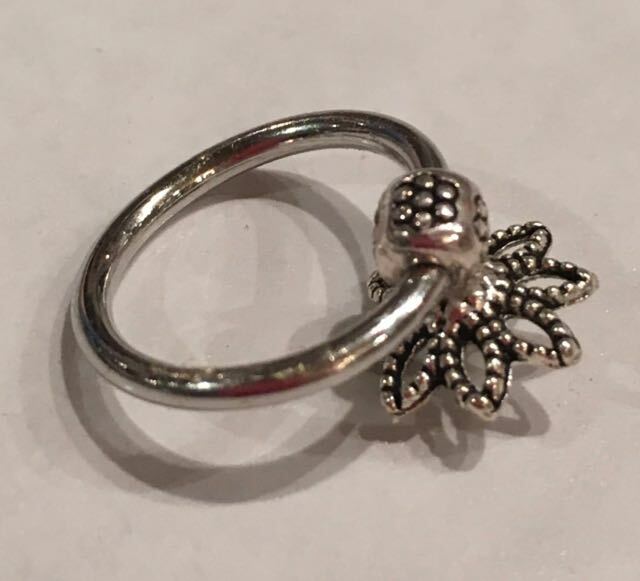 I also bought new finding beads that would fit on the ring. The towel bar was easy. 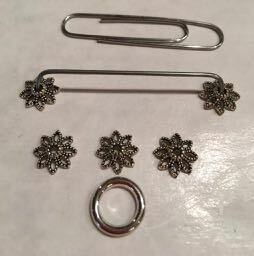 I opened out the paper clip and cut off the rest of it just a little into the curve and then using jewelry pliers bent the ends and cut them the size that I wanted. And glued everything in place. I need to work on the towels now. If you have traveled to London and ridden the Underground train (The Tube), you will see signs warning travelers to "Mind the Cap". There is a gap between the floor of the station platform and the floor of the train car, so one must be mindful to step over the gap to avoid an awful accident of getting the foot caught in that gap. I have my own gaps that I mind very much! 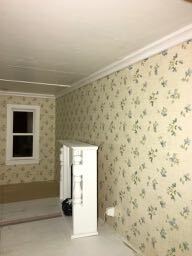 The next project is installing the crown molding in the bathroom--and other rooms. Because the floors and walls don't exactly fit, there are gaps between the molding and the ceiling. I had seen in someone's blog how to close that gap: caulking. So I glued in the crown molding then ran a thin bead of caulk alone the gap when the glue had set. I wet my finger and smoothed out the bead of caulk. You get a very smooth seam. The bedroom ceiling was really awful. I should have taken a before photo, but you will see in the next bathroom photo the type of gaps that I need to hide. So, I am back in business. I hope to keep the blog up as I try to add the finishing touches. 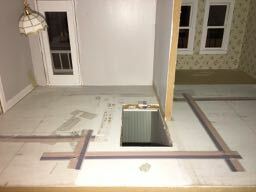 I will continue install crown molding then I will install the flooring. Keep in touch and watch me work. It's good you got over your electrical dilemma....and now you can do things that are more fun. I like that you created that wall before you put it up. Looks really nice! Thanks for sharing your tape wiring woes! 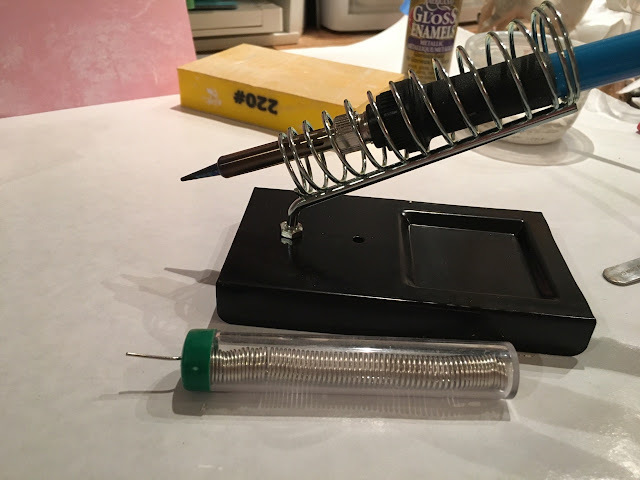 I was waffling between the two and decided on round wire. I've used tape wire before and it can be a nightmare. Great ideas for towel bars!! Looking forward to your finished project.